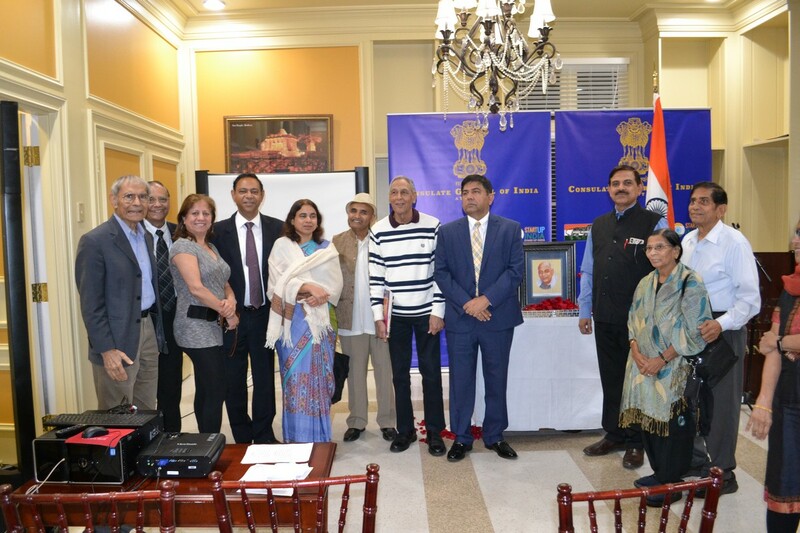 Atlanta, GA, November 9, 2018: The Consulate General of India, Atlanta in collaboration with the Sardar Patel Foundation of North America and Gujarati Samaj of Atlanta celebrated the 143rd Birth Anniversary of Sardar Vallabhbhai Patel on Tuesday, October 31, 2018. 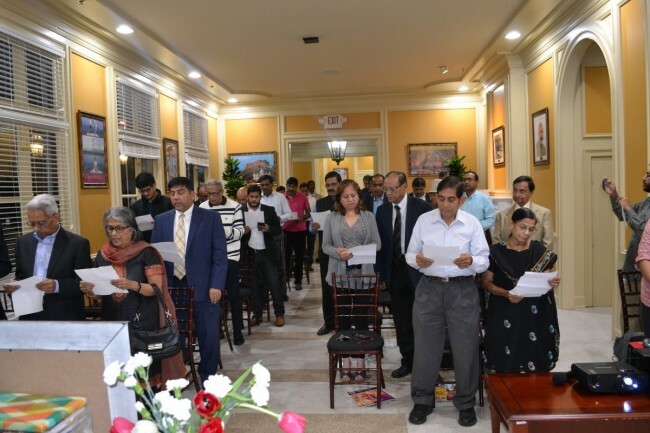 The joyous event was graced by Consul General in Atlanta, Dr. Swati Kulkarni, Consulate Officers/staff; former President of Gujarati Samaj and President of Sardar Patel Foundation for 2018 and 2019, Vasudev Patel, current President Bakul Patel, Sardar Patel Foundation of America’s Founder President Vinodbhai Patel and Founder member Chandler Sharma , leading members of the Indian community and media representatives. Consul General Dr Kulkarni welcomed and thanked all for attending the Bhartiya Ekta Day celebrations. We want to celebrate the unity of India, to which immense contribution has been made by Sardar Patel. We all know that he is known as the ‘Iron Man of India’ and he ensured that India was eternal, is eternal and will be eternal. Dr Kulkarni led the gathering in reciting the Rashtriya Ekta Divas pledge, first in Hindi and then in English. The attendees then offered floral tributes to Sardar Vallabhbhai Patel. Vice Consul Bikash Kumar read an uplifting poem in Hindi composed by him to mark the occasion. His recitation of the poem in praise of Sardar received wide applause. Vinod Patel gave a brief history of the Sardar Patel Foundation. Lauding Sardar Patel, he said, “Sardar Patel is known as a Lion man but I may add that he was also an Iron man. Hitler was afraid of Churchill. Churchill was afraid of Gandhi. Gandhi was afraid of God. But Sardar Patel was afraid of only his conscience. Vinodbhai then referred to a Hindi movie ‘Mera Gaon Mera Desh’. Sardar Patel used to say ‘Mera Desh mera Gaon’ because he had the welfare of whole India in his heart. He also advised the youth to be innovators and job-givers rather than job-seekers. Speaking of the statue, he said that it is not merely a statue but a symbol of oneness. He also recognized attorney Chandler Sharma. Vasudev Patel shared that Vallabhbhai Patel was born on 31st October 1875, in a farming family in a small village in Nadiad, Gujarat. He wanted to study law in England. When the pass and ticket arrived, it was addressed as V. Patel. His elder brother’s name was Vithalbhai so both had the same initial, V. His brother also wanted to study law so Vallbhbhai let him go first. Later on, he went to England, and became a Barrister and had a very flourishing law practice in Ahmedabad. He used to wear suits and tie and, in the evening, go to the Club, play bridge and smoke cigars. But he gave it all up and joined Gandhi in India’s Independence struggle. He threw his British clothes in the bonfire and started wearing dhoti and kurta. He galvanized farmers in Gujarat in a non-violent revolt in getting the harsh taxes repealed. He was imprisoned several times. In prison, he and Gandhi bonded together like brothers. He played an active role in the Quit India movement. He led the monumental feat of integrating into the newly independent nation approximately 565 self-governing princely states. As the first Deputy Prime Minister, and Minister of Home Affairs, he unified the country earning him the sobriquet ‘Iron Man of India’. In India, Prime Minister Narendra Modi inaugurated the world’s tallest and imposing 182 meter landmark Statue of Sardar Patel to coincide with his 143rd Birth anniversary as a befitting tribute to the visionary leader for his pivotal role in India’s independence and unity. The attendees exchanged Happy Diwali greetings and then enjoyed the delicious dinner offered by the ever hospitable Consulate.